Benjamin Oliver (b. 1981) is a composer of, in the main, contemporary instrumental music. More than fifty of his works have been performed, his music has been broadcast on BBC Radio 3 and his piece ‘Loop Concerto’ was nominated in the Contemporary Jazz category of the British Composer Awards 2017. His musical ideas often contain loops that reference jazz and other riff-based music but are combined, or offset by, a fascination with mechanical devices and systematic processes. He is Associate Professor in Composition at the University of Southampton and conductor of Workers Union Ensemble. Key musical collaborators include: pianist Yshani Perinpanayagam (Kammer Klang, 2017); Ensemble Paramirabo (Montreal, 2016); London Sinfonietta (‘Alternative Visions @ The BFI’, 2014; ‘Notes to the New Government’, 2015; Sinfonietta Academy 2016; Sinfonietta Short for solo percussion, 2017); ensemble mise-en (Mise-en Music Festival 2014 & 2018, New York); BBC Symphony Orchestra (SaM commission, 2013); Århus Sinfonietta (Sounds New, 2011); jazz pianist Ivo Neame (The Loop Project, 2017); and theorbo player Elizabeth Kenny. Upcoming projects include a work with poet Luke Wright for Riot Ensemble, a harpsichord solo for Jane Chapman, a duo for Pasha Mansurov (flute) and Yshani Perinpanayagam (piano) and a new large-scale theatre piece for Ensemble Paramirabo for puppeteers and ensemble developed in collaboration with theatre director Rachel Warr. Benjamin Oliver is a composer, conductor, electronic musician and pianist. He was born in 1981 and grew up in Chatham, Kent, in the UK. He completed his AHRC and PRSF funded DPhil in Composition, supervised by Sam Hayden, at the University of Sussex in 2010. 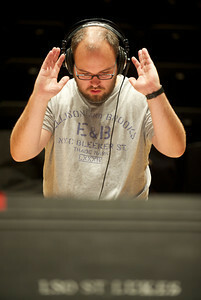 Ben composes, in the main, contemporary instrumental music. More than fifty of his works have been performed and his music has been broadcast on BBC Radio 3. His musical ideas often contain loops that reference jazz and other riff-based music but are combined, or offset by, a fascination with mechanical devices and systematic processes. He is Associate Professor in Composition at the University of Southampton. Ben’s music has been commissioned and performed internationally and in the UK by ensembles and soloists including: London Sinfonietta (Sounds New 2012; ‘Alternative Visions @ The BFI’, 2014; ‘Notes to the New Government’, 2015, London Sinfonietta Academy 2016; Sinfonietta Short for solo percussion, 2017); ensemble mise-en (Mise-en Music Festival 2014 & 2018, New York); BBC Symphony Orchestra (SAM Commission, broadcast BBC Radio 3); Yshani Perinpanayagam (Kammer Klang, 2017); Elizabeth Kenny (Cumnock Tryst 2014, Vantaa Festival 2016); jazz pianist Ivo Neame (with Kent County Youth Orchestral, 2014 and HARTLEY Loop Orchestra, 2017); Emanuele Torquati; Orkest de Ereprijs (International Young Composers Meeting 2010, The Netherlands); Ostrava Banda (Ostrava Days Festival 2009, Czech Republic); Aarhus Sinfonietta (Sounds New 2011); Mercury Quartet; Black Dyke and Rothwell Temperance Brass Bands; Dan Stern’s Woodwork (London Jazz Festival 2008); The Mobius Ensemble with Hackney CYM Children’s Choir (Spitalfields Festival 2010); Yorkshire Philharmonic Choir; Musarc (London Festival of Architecture 2010); Stsura/Foyle/Lang Piano Trio (Deal Festival 2015); Riot Ensemble and Juice Vocal Ensemble; Kosmos; and Leeds Sinfonia. Ben was chosen as one of the winners of the International Composer Pyramid (ICP) 2010 and 2011, set-up by the Sounds New Contemporary Music Festival, UK, with Coups de Vents, France. 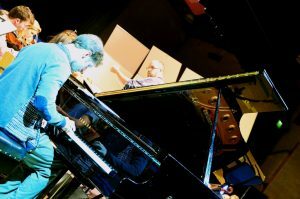 His piece was voted best in the audience votes in both England and France in the ICP 2012. He was one of Sound and Music’s New Voices 2014 and is a former LSO Soundhub Associate Composer and was nominated in the Contemporary Jazz Category of the British Composer Awards 2017. Ben is conductor of the Workers Union Ensemble who have commissioned works for their unique line-up by many young (and older) composers, performed around the UK and in 2016 recorded a work by Matthew Kaner for broadcast on BBC Radio 3. 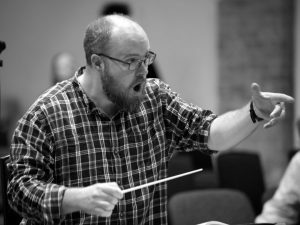 He has also worked with a range of professional, youth, amateur and student ensembles and orchestras including London Sinfonietta, Kent County Youth Orchestra and University of Leeds Union Symphony Orchestra. In November 2014 he conducted the premiere of Michael Finnissy’s Remembrance Day, performed by students from the University of Southampton alongside members of the London Sinfonietta and Exaudi Vocal Ensemble. In February 2017 he directed ‘The Loop Project’ which featured Ivo Neame (piano), Jasper Høiby (bass) and Jon Scott (drums) performing alongside Southampton students. He lives in Bitterne Park, Southampton, with his family and imaginary dog.